The wacky robots from the award-winning apps, videos, and Netflix show, Ask the StoryBots, now star in their own board books! No matter their shape or size or what they’re hauling, trucks rule! 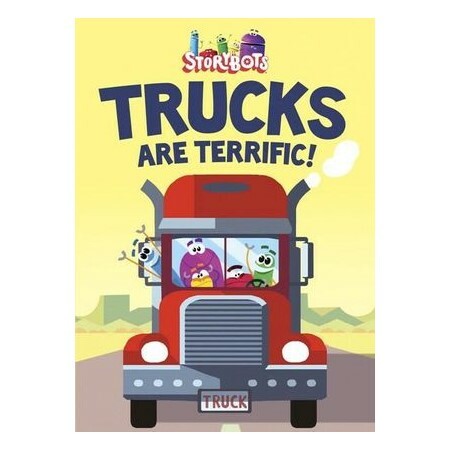 Join the StoryBots as they drive trucks both familiar and silly. Toddlers and preschoolers will recognize the signature catchy rhymes and colorful art from the video “Drive a Truck” on YouTube. The StoryBots are curious little creatures who bring a world of learning and fun to kids ages two to seven, across a broad range of subjects, with apps, videos, books, activity sheets, and an animated show. The award-winning content is developed by teachers and early-education experts and then brought to life by an amazing network of writers, artists, animators, performers, and musicians. Gregg and Evan Spiridellis are brothers and the founders of StoryBots and JibJab Bros. Studios. Their digital media company is dedicated to making award-winning online entertainment and educational content, which has been seen by hundreds of millions of viewers. You can find all the StoryBots videos, apps, games, and activities at StoryBots.com, on YouTube, and view Ask the StoryBots on Netflix. JibJab Studios is based in Venice, California.From the eBook edition.